Painter and sculptor Jules de Goede was one of the most outstanding artists on the London scene from the mid 1960s. Not only was he totally dedicated to his calling as an artist but he also had the principles and inner resources to oppose today’s capitalist society and work for a more advanced form of social existence. Born in Rotterdam, Holland in 1937, his earliest memories were of living in a cellar during the aerial bombardment of Nijmegen and living under military occupation. He loved art from the youngest age and won a place at the Arnhem Academy of Fine Arts even before he was old enough to attend. In 1956 his newly widowed father took his seven children to Australia and settled in Sydney where Jules worked at a variety of jobs, at the same time resuming his art studies. During his nine-year stay in Australia, he took part in some 30 exhibitions. He also spent time with a group of philosophers at Canberra University. His discussions bore fruit in the abstract style which he began to adopt in the 1960s. He was one of the first painters to break through the surface of his canvases, creating a mysterious black hole even before it was theorised by astrophysicists. As he made new discoveries, he felt the need to return to Europe, arriving in London in 1965. With Peter Sedgeley and Bridget Riley he helped to set up the studio blocks and initiated the first artists’ open studio events, now a major part of the London cultural calendar. In the 1972 he was invited to teach at Middlesex University, then the Hornsey College of Art, scene of a tumultuous student occupation only a few years before. It was through his teaching that he inspired scores of students, many of whom were to become close friends. I first met Jules in 1990 through his student, painter Andy Cole, who was then organising contemporary art exhibitions in London. Jules’ friendly, outgoing personality combined with his unique dedication to abstract art attracted me like a bee to nectar. The brilliant visual paradoxes on his canvases seemed to be the embodiment of a pictorial dialectic attempted by no one else in art. His amazing studio in a turn-of-the-century Jewish school in Stepney Green was a brave new world, a haven and a buzzing workshop all rolled into one. There his paintings had given birth to sculpted children, some of them quite impish, arguing with their parents. The visual illusions on canvas were even more puzzling in three-dimensional constructions. Seeing Jules’s work in progress, the systematic, yet playful working through of ideas and themes made them look almost like sequences from a film. In addition to his painting and making steel and wood sculptures, Jules was a prolific draughtsman and printmaker. When the Movement for a Socialist Future, later to become part of A World to Win, was formed in 1999, Jules became a founder member. He attended many discussions and gave a lecture about the philosophy of his work to students at London University to the University of London Union Marxist Society. 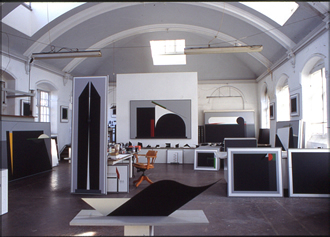 He contributed paintings to fund-raising art lotteries organised by the Movement and hosted benefits in his studio. In 2006 he made a Herculean effort to assemble the material for a book documenting his life and work. It was launched at a one-man show at the Angus Broadbent gallery at Chepstow Place, Bayswater in June 2006. Jules lived entirely for his art, which made it difficult, perhaps impossible, for him to have a steady partner or raise a family. Instead he worked incessantly – painting, drawing, sculpting and recording his work on camera. At the same time, he always made the time to be with friends, whether in his studio or having a meal together. He was full of energy, optimism and new ideas, making some of his best work over this summer, knowing he had only weeks to live. He is mourned by his family, his friends, fellow artists, students, critics and gallerists. He is equally missed by members of A World to Win. 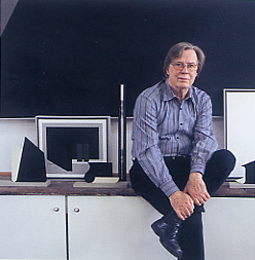 Jules de Goede, born Rotterdam 20 May 1937, died London 19 September 2007.